Our own unique birdcage design, light up acrylic table numbers to enhance your wedding/party or corporate event tables. Manufactured from clear 4mm thick acrylic with a medite laser cut base (the base is finished in natural colour but you may paint if you wish). Standing at 17 cm high x 9cm wide and powered by a long lasting led waterproof light (will last throughout the longest of event days and beyond). Select your top table and number choice from the drop down list. If you require more than listed or are looking for a bespoke design please text us on 07880 700735. Check our other designs listed. 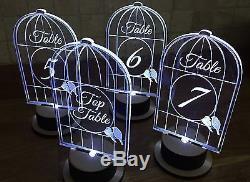 The item "Table numbers, acrylic, light up, Bird cage design" is in sale since Sunday, December 20, 2015. This item is in the category "Home, Furniture & DIY\Wedding Supplies\Centerpieces & Table Decor". The seller is "mollytuff" and is located in Derby. This item can be shipped to United Kingdom, Austria, Belgium, Bulgaria, Croatia, Cyprus, Czech republic, Denmark, Estonia, Finland, France, Greece, Hungary, Ireland, Italy, Latvia, Lithuania, Luxembourg, Malta, Netherlands, Poland, Portugal, Romania, Slovakia, Slovenia, Spain, Sweden, Australia, Canada, Brazil, Japan, New Zealand, China, Israel, Hong Kong, Norway, Indonesia, Malaysia, Mexico, Singapore, South Korea, Switzerland, Taiwan, Thailand, Chile, Germany, United States.